When PJ Mode began to purchase old maps in the 1980s, he set out to amass a typical collection of world maps. But along the way, his attention turned to unusual maps that dealers weren’t sure how to categorize—those that attempted to persuade rather than convey geographic information. The interest has culminated in a collection of more than 800 “persuasive maps,” as they are now called, which can be found in digital form through Cornell University’s library. Mode has sorted them into themes, from imperialism to religion to slavery, many with meticulous notes about their history and meaning. 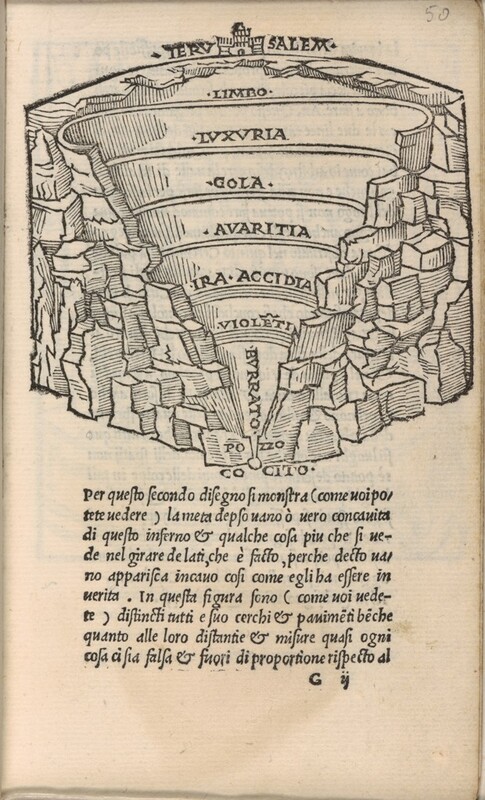 One of the oldest, from a 1506 Italian manuscript, gives an overview of hell, while more recent acquisitions include a facetious 2012 New Yorker cover of the Second Avenue subway line. Marc-William Palen, a University of Exeter history professor and author of The “Conspiracy” of Free Trade, recently came across the collection. “I got lost in it for days,” he says. Palen, who specializes in British and American imperialism, was particularly taken with an 1888 map depicting the trade policy platforms of the year’s presidential candidates, Democratic incumbent Grover Cleveland and Republican Benjamin Harrison. While Cleveland and his party supported free trade, the Republicans’ platform was deeply protectionist. 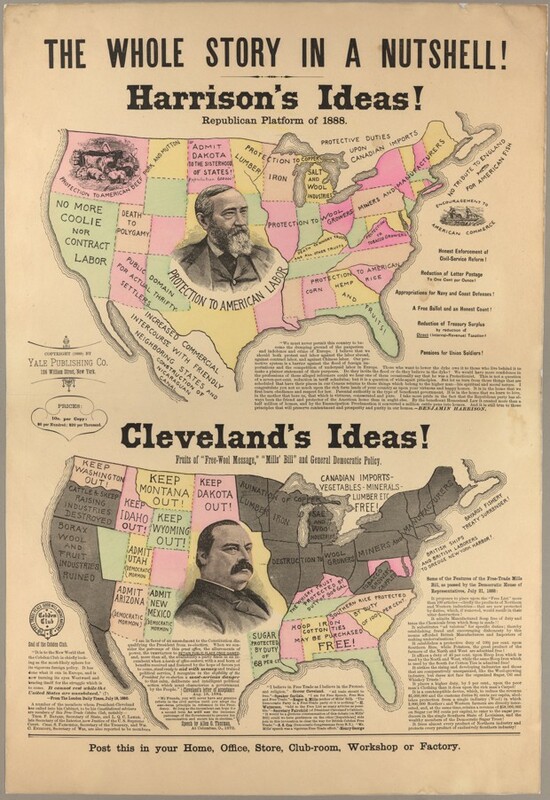 The map, titled “The Whole Story in a Nutshell!”, shows a jowly Cleveland below a slim Harrison, who is placed among soothing pastel-colored states, while a number of states surrounding Cleveland are a foreboding gray. The map declares that Harrison (the eventual victor) will “protect American labor” and products such as lumber, iron, rice, corn, hemp, and fruits, while Cleveland will destroy wool growers, miners, and the like. Near Cleveland, in the bottom left corner of the map, is the seal of the Cobden Club, a London-based group that supported free trade. This, Palen says, shows how phobias around free trade at the time were focused on Britain.